Thank you for thinking of us for your gifting, we are excited to be able to offer this new option!! We have left the amount variable so you can fill it an as you like and once you have gotten to the check out screens, you will be given the option to send your recipient a virtual copy, or to print it yourself for gifting in person, you can even add a note to your special someone! 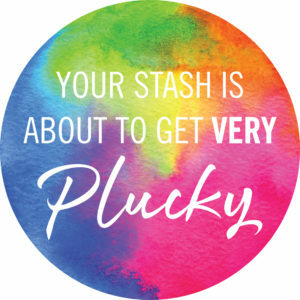 Plucky gift certificates are redeemable only for the purchase of Plucky items via the Plucky Reserve store at http://www.thepluckyknitter.com/shop/ and Plucky blog updates. Plucky gift certificates have no inactivity or service fees for non-use and do not have an expiration date. Plucky gift certificates are in U.S. dollars, not for resale, and not redeemable for cash or monetary credit. They cannot be returned for a cash or credit refund and may not be used to purchase other Plucky gift certificates. A lost or stolen Plucky gift certificate cannot be replaced without the original proof of purchase, and replacement of the gift certificate will be with another certificate having the credit balance only as shown by our records. Any unused balance will be placed in the recipient’s gift certificate account. Remaining balances may be verified by contacting Plucky at customerservice@thepluckyknitter.com. Plucky reserves the right to close customer accounts and request alternative forms of payment if a fraudulently obtained gift certificate is either redeemed or attempted to be redeemed. PLUCKY MAKES NO WARRANTIES, EXPRESS OR IMPLIED, RELATED TO PLUCKY GIFT CERTIFICATES, INCLUDING ANY WARRANTY OF MERCHANTABILITY OR FITNESS FOR A PARTICULAR PURPOSE. IF A GIFT CERTIFICATE IS NON-FUNCTIONAL, YOUR SOLE REMEDY, AND OUR SOLE LIABILITY, WILL BE THE REPLACEMENT OF THE GIFT CERTIFICATE WITH ANOTHER HAVING THE CREDIT BALANCE, IF ANY, THAT WE SHOW ON THE ACCOUNT. The validity, interpretation, and construction of this agreement are governed by the laws of the State of Michigan, U.S.A., and any claim must be brought only in courts located in Kent County, Michigan, U.S.A.
Plucky reserves the right to change these terms and conditions from time to time in its sole discretion. Such changes will be posted at http://www.thepluckyknitter.com/shop/.